Do I have to be a United States Citizen? Yes. You must be a United States Citizen to be a registered voter. If you have a Green Card, that indicates that you are not a United States citizen. What identification do I need in order to register to vote? The following are exempt from providing additional ID: Persons over 65 years of age or older, persons with a temporary or permanent physical disability, members of the uniformed service on active duty and their spouses, by reason of such active duty, are absent from the county on election day, members of the Merchant Marine and their spouses who by reason of the active duty are absent from the county on election day, persons currently residing outside the United States who are eligible to vote in Florida. Can I use a nickname when I register to vote? No. You should use your legal name just as you would for any legal document. Per Florida law, Voter Information Cards are sent to all voters upon validation of their initial voter registration application, or to currently registered voters when making a name, address or party affiliation change. New information cards will be sent to all voters who are in a precinct in which there has been a change in their polling location. Voter Information Cards are not necessary to vote. They serve as confirmation of your voter registration and provide information on your Precinct and Polling location. If you have lost your information card and would like a new one, you must request one in writing, or complete a voter registration application. Any elector applying to vote in any election who requires assistance in voting, including language assistance, may bring a person of their own choice with them (other than the elector’s employer, an agent of the employer, or an officer or agent of his or her union) to assist the elector in casting his or her vote. Applicable forms are furnished at the polling place and early voting site according to 101.051, Florida Statutes. How do I know where I vote? That information is provided to you on your voter information card, or you may use the Precinct Finder. If you've lost your card, you may request a replacement in writing, or by completing a voter registration application. What hours are the polls open in Pasco County? What are the identification requirements for voting at the polls? Florida law requires two forms of identification at the polls. In order to vote you must present both signature and photo identification. It can be one form of identification, such as a Florida driver license, or two separate forms of identification. For example, you may have an ID card with your photograph on it but not your signature. You would then need to present a second form of identification with your signature on it. If you do not have proper ID, you must vote a Provisional Ballot, which is a paper ballot issued at the polling place or at the early voting site to a voter who does not provide photo and signature identification or whose eligibility to vote cannot be determined. Additionally, it will take you longer to be processed to vote. A person casting a provisional ballot shall have the right to present written evidence supporting his or her eligibility to vote to the supervisor of elections by not later than 5 p.m. on the second day following the election. How do I know what my congressional, state senate, and state house districts are? Pasco County is included in the Twelfth Congressional District. We are represented by the Tenth, Sixteenth and Twentieth State Senate districts and the Thirty-sixth, Thirty-seventh and Thirty-eighth State House districts. The districts in which you are eligible to vote are available on-line by using the Precinct Finder. Who is required to vote a provisional ballot? A provisional ballot is a paper ballot issued at the polls. 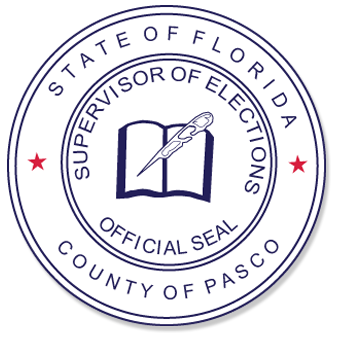 The ballot is not cast until the validity of the ballot is determined by the Pasco County Canvassing Board upon evidence provided by the voter and the supervisor of elections staff. A person casting a provisional ballot shall have the right to present written evidence supporting his or her eligibility to vote to the supervisor of elections by not later than 5 p.m. on the second day following the election. A voter claiming to be properly registered in the state and eligible to vote at the precinct but whose eligibility cannot be determined. A voter who refutes the supervisor’s office confirmation that he/she is not registered/eligible. A voter who is not able to provide picture/signature identification at the polls. A voter who has been challenged prior to election day or at the precinct on election day. A voter whom the precinct register indicates voted early, but the pollworker is unable to verify if the voter already voted. A voter who refutes the indication on the precinct register that they have already voted early or by mail, and the pollworker is able to confirm by phone call to the elections’ office. A voter whose signature on their ID does not match their signature on the precinct register and refuses to complete an affidavit. A voter whose Florida Driver License #, Florida Identification # or Social Security # has not yet been verified by the Department of State in conjunction with the Department of Highway Safety and Motor Vehicles. May I vote before Election Day? Yes. You may contact our office as to when and where you may vote early or request a vote by mail ballot. Where do I obtain a vote by mail ballot? You may obtain a vote by mail ballot by phoning, writing or coming in to the Supervisor of Elections' Office, or you may complete an online application. May I request a vote by mail ballot for someone other than myself? Yes. You may request by phone a vote by mail ballot be mailed to anyone in your immediate family or anyone for whom you are a legal guardian. Any request for a voter must include the voter's name, date of birth, address, and where the ballot is to be mailed. As well, the requester must provide their name, address, driver license number, and the relationship to the voter. Five days prior to the election you may carry-out up to two ballots from the Supervisor of Elections' Office for anyone as long as the above information is provided in writing from the voter and it specifically designates you as the person to carry the ballot out and you provide photo identification. There is no limitation on the number of carry-outs for immediate family. If you returned your vote by mail ballot to your supervisor of elections, but forgot to sign the ballot, your ballot will not count unless you complete and return the Omitted Signature Affidavit for Vote-by-Mail Ballot no later than 5:00 p.m. on the day before the election. Please follow the instructions on the form carefully, as failure to follow these instructions may cause your ballot to not be tabulated. If you returned your vote by mail ballot to your supervisor of elections, but the signature on the Voter's Certificate did not match the signature on the Supervisor of Elections' file, your ballot will not count unless you complete and return the Signature Cure Affidavit for Vote-By-Mail Ballot no later than 5:00 p.m. on the Monday before the election. Please follow the instructions on the form carefully, as failure to follow these instructions may cause your ballot to not be tabulated. How do I notify the elections office? You may use this form, ELECTOR’S REQUEST FOR REMOVAL, to notify us that you are no longer a resident of Pasco County and want to have your name removed from the Pasco County voter registration rolls, or if for any reason you no longer want to be a registered voter. You may fax this form to (352) 521-4319, e-mail it to webcomment@pascovotes.com, or mail it to PO Box 300, Dade City FL 33526. For the voter’s protection the form must have an original signature. Note: This form will change the status of your voter registration from active; however, it will not exempt your information from public records. Why do I have to declare a political party? You are not required to declare a party preference. However, you should know Florida is a closed primary state. In a primary election, voters may only vote for candidates in their party. By not selecting a party, you limit your vote in the primaries to only non-partisan candidates and issues. The only exception is a Universal Primary Contest (UPC). A UPC is a contest in a primary election in which all candidates have the same party affiliation and the winner will have no opposition in the general election. All qualified electors may vote on a UPC regardless of party affiliation. In the general election, party affiliation is not an issue. You may vote for any candidate, regardless of party preference. When and how do I change my party preference? A party affiliation may be changed at anytime. However, when the registration books are closed for an election, voter registration and party changes will be accepted but only for the purpose of future elections. Party changes may be submitted on a Florida Voter Registration Application or by signed, written request which includes either your date of birth or your voter identification number. Requests should be mailed to PO Box 300, Dade City FL 33526. Can I register here if I live here part of the year and in another state part of the year? Yes. However, you must determine which place you want to be your legal residence. You cannot be registered in two places at once. If I have citizenship in the U.S. and another country, can I still register to vote? Yes, as long as you are a U.S. citizen and satisfy the other requirements for registration. Can I register to vote if I am homeless? Yes. You will be registered in the precinct where you have mail delivered. When completing the registration application, write "homeless" in the residence address box and your mailing address in the mailing address box. You may change your address by telephone (800)851-8754, by using the online voter registration application, submitting a completed, signed Voter Registration Application. If you are currently registered to vote in the state of Florida, you may also request an address change in writing by mailing a signed, written request that indicates your date of birth or your voter registration number to PO Box 300, Dade City FL 33526. What is Voting Restoration Amendment 4? On November 6, 2018, Florida voters passed Voting Restoration - Amendment 4. · Pasco County Clerk of the Circuit Court and Comptroller, (352) 521-4542 or (727) 847-8031. Please note: the applicant must call the Florida county where sentenced. In addition, the Pasco County Supervisor of Elections is willing to assist applicants. Call (800) 851-8754, email webcomments@pascovotes.com or visit www.pascovotes.com. No. An applicant must re-register to vote. When completing a paper voter registration application, be sure to complete Sections 1 –7 and sign the oath at the bottom of the application. State law requires all voters to be registered at least 29 days before an election. Within a few weeks of registering, the applicant should receive a Voter Information Card in the mail. If not received, please contact the Supervisor of Elections office to ensure we have the correct address. Once registered, it is the responsibility of voters to keep registration information (signature, name, address and political party affiliation) up to date. Voters can update their information by visiting www.pascovotes.com or calling (800) 851-8754. Pollworkers are people that work at the polling places on election day. How can I become a pollworker? You must complete an online Pollworker application. The Supervisor of Elections' office will contact you to schedule an orientation. At this meeting you will be briefed on pollworker duties and responsibilities, hours to be worked, training sessions, physical and clerical requirements and rates of pay. You will be given an opportunity to ask any other election-related questions that might help you decide if this is a job for you. You will be advised if you have not qualified to be a pollworker. Qualified applicants will be added to our pollworker file and notified by mail when they are scheduled for training to work in an election. What type of voting system does Pasco County use? Pasco County uses Election Systems & Software's (ESS) optical scan paper ballot system, where votes are cast by filling in ovals, similar to the lottery. How are ballots tabulated on election night? When the polls close on Election Night, vote totals are transmitted from each precinct via modem to the central tabulation site at the Elections Service Center in Dade City. The vote by mail paper ballots are tabulated at the Elections Service Center in Dade City on an optical ballot reader. These totals are compiled to produce official totals. A poll watcher is a person designated by a candidate, political party or political committee to watch and observe the conduct of elections. Poll watchers are not paid for their services by the Department of Elections or, in municipal elections, the City Clerk. What is a Solicitation Boundary? Per F.S. 102.031(4)(a) No person, political committee, committee of continuous existence, or other group or organization may solicit voters inside the polling place or within 100 feet of the entrance to any polling place, or polling room where the polling place is also a polling room, or early voting site.